Is the clutter you've built up this past year ruining your home's mojo? Now (or maybe later, after you've had a lie down, a cuppa and a biscuit) is the time to tackle the decluttering. Still convinced you've not let it get out of control? These signs below are a real giveaway that the clutter has got the better of you... We show you how to tackle it with as little effort as possible and, occasionally try to talk you into clever ways of repurposing it. Plus, there are a few handy storage tips thrown in for good measure. Need more cleaning advice? Hop to our hub page for all sorts of helpful features. Not only is your wardrobe full but you have spare suitcases stuffed with seasonal clothes, or incentive pieces from years back that you’re determined to slim your way into. Chances are if you do hit your goal weight, you’ll use it as an excuse to go out and buy some new clothes (guilty). It’s time to sift it and declutter it; either to charity shops or better still, to sell online. Then enjoy all that space in the wardrobe or under the bed. If you really can’t say goodbye to all of those excess clothes, check out these awesome clothes storage ideas. Are your drawers stuffed with plastic bags? As soon as the 5p price was whacked on they became a precious commodity. You can’t throw them away because they’re worth something now, and it’s wasteful, right? But you keep forgetting them and end up buying more. Leave some permanently in your car or at the bottom of your bag for when you are out shopping; reserve some for all those clothes you're going to take to the charity shop; then see if you can recycle the rest. Check whether your local council will take them away — if not, some supermarkets will recycle them. Or... just improve your kitchen storage with these clever ideas. Got a teetering pile of glossies from that magazine subscription you were given? It’s not the Encyclopedia Britannica; you don’t have to keep the collection. Say goodbye to these shiny distractions, yes, even declutter your copies of Real Homes (there’ll be another edition next month!). Seek places online that might be grateful of some fresh(ish) reading material (your doctor's surgery is usually a good option). Ahem, if you can't bear to say bye to your back issues, you might like to check out these clever living room storage ideas. A well chosen objet d’art can help to give your home a worldly look and you a well-travelled aura, But not those holiday mementos – aka tat – you bought under the influence of heat and alcohol. That said... you can create a rather lovely gallery wall display out of a few well chosen pieces (check our guide to find out how). Are your bathroom and bedroom shelves laden with presents that you looked at and thought ‘does this person really know me or was this the freebie out of a 3-for-2 offer?’ They obviously didn't check out our gift guides, then. Time to regift or donate. The same goes for those unidentifiable objects painstakingly handmade by your infant relatives in their arts and crafts classes. They’re old enough to start university now. Move on. Still hanging onto all your/your children's old schoolbooks? They may have been the best years of your/their life, but how often have have you taken them down from the loft or out of their dusty boxes and re-read your/their 13-year-old scrawl? Nostalgia’s all very well, but these only serve to remind you of how much you once knew and have now forgotten. Or... stash them away for another year in these home office storage solutions. Back in the 1980s there was an advert for Scotch video tape where a skeleton was still happily using his tapes in 2021 because he could ‘re-record, not fade away’. Turns out it wasn’t the tape quality but video recording itself that faded away. For personal tapes, get them saved to your computer. For old programmes, they are probably being re-run somewhere on TV if you search hard enough. Coat hangers don’t mysteriously multiply when you close your wardrobe doors. You put them in there when you shove in your dry cleaning or bring them back with new outfits. Just say no at the till, and take the others back to dry cleaners. 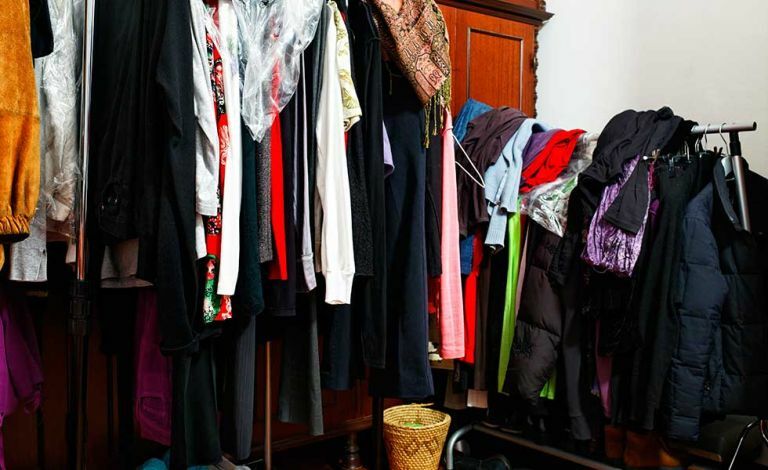 You’ll need fewer hangers anyway, once you’ve streamlined your clothes. Check out these ideas for dressing rooms and walk-in wardrobes – if they don't spur you on to organise your wardrobe, we'll eat our (many, rarely worn) hats. Have you ever broken out an old, part-used roll of wallpaper in case of a patching emergency? If it’s been up in the loft, in the shed or at the back of a cupboard for years, you’re more likely to redecorate than you are to use this. Give it to the kids to paint on instead. Same goes for old paint tins, but they probably need to go straight to the local tip for recycling. Shed storage ideas anyone, if the old DIY provisions are the least of your problems out there? Storage ideas for kids' rooms – incentivise them!